Some three hours after an incident took place in the southern Gaza Strip on the evening of November 11th a report appeared on the BBC News website’s main homepage, ‘World’ and ‘Middle East’ pages under the headline “Israelis ‘kill Hamas commander’ in Gaza exchange of fire”. 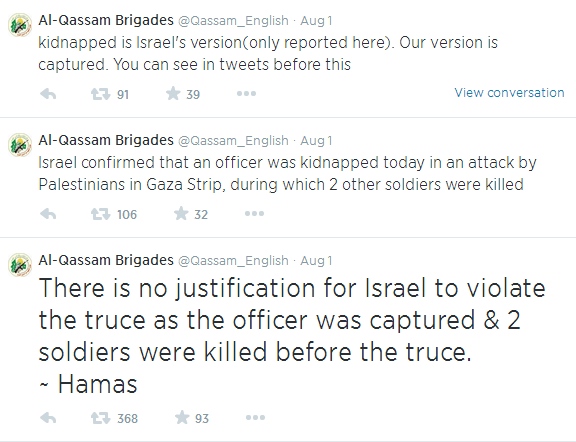 Several versions later, the report was re-titled “Israelis kill Hamas commander in undercover Gaza raid”. By the time that second headline was written, the IDF had clarified that the mission was not a “raid” but an intelligence-gathering operation. Still later – some 14 hours after the incident occurred – the report was again re-titled “Eight killed in covert Israeli action in Gaza“. In fact – as had been reported by the Times of Israel and others by the time that version of the report was published – more than four of the dead were Hamas operatives. 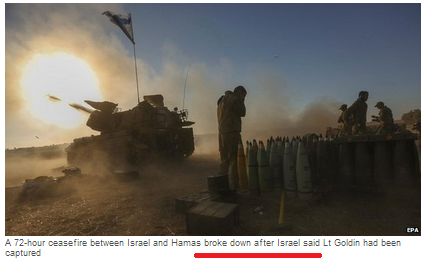 AFP actually described its information as coming from “Gazan security sources” – in other words, Hamas. “Sirens later sounded in communities across southern Israel and rockets were fired from Gaza, without causing harm. That first sentence remained in later versions of the report. “Following the clashes, at least 17 projectiles were fired at southern Israel as of 05:05 a.m Monday, three of which were shot down by the Iron Dome air defense system, the army said with no immediate reports of casualties. Readers were not informed in any versions of the BBC’s report that flight paths to Ben Gurion airport had to be changed due to the rocket fire or that schools, colleges and train stations in the affected area had to be closed. “Seven Palestinians, including a local Hamas commander, have been killed during an Israeli operation in the Gaza Strip, Palestinian officials say. A spokesman for Hamas, the militant Islamist group that dominates Gaza, described the incident as a “cowardly Israeli attack”. 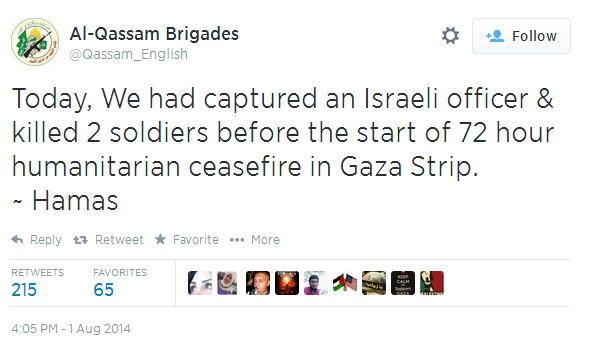 Hamas officials and medics said seven Palestinians were killed, four of them militants. The senior Hamas member killed was named as Sheikh Nur Barakeh, a commander of the Izzedine al-Qassam brigades, the group’s military wing, in Khan Younis, in the south of the territory. Hamas said Israeli special forces fired from a car around 3km (2 miles) inside the Gaza Strip. That account obviously gives BBC audiences the mistaken impression that the “seven Palestinians” were killed before “an ensuing firefight” rather than during the exchange of fire. Readers were not told that the Hamas commander Barakeh was reported to be involved with Hamas’ tunnel programme. Later versions of the report (9 and 10) included a sub-section titled “What happened?” which quoted “Palestinian sources” and “Palestinian officials” without clarifying that the source was again Hamas. The final part of all versions of the BBC’s report continued the corporation’s deliberately euphemistic editorial policy of portraying the violent rioting, terror attacks and infiltrations along the border between Israel and the Gaza Strip as “protests”. Notably, BBC audiences have not been informed to date of the relevant and related issue of last week’s transfer of $15 million in cash from Qatar to Hamas. 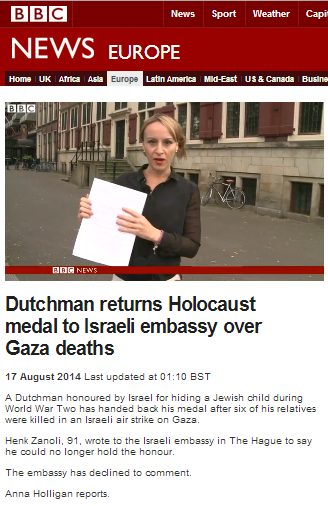 “Between August 16th  and August 20th inclusive the BBC News website’s Middle East page featured an article titled “Dutchman returns Holocaust medal after family deaths in Gaza“. The same article also appeared on the website’s Europe page, as did a filmed version of the report (also shown on television news) by the BBC’s correspondent in The Hague, Anna Holligan, under the headline “Dutchman returns Holocaust medal to Israeli embassy over Gaza deaths“. We noted at the time that another person present in the apartment when the incident took place was a senior Hamas commander called Mohammed Mahmoud al-Maqadma. Some weeks later we noted that it had emerged that one of the Ziyadeh (Ziadah) brothers – also present in the building at the time – was also a member of Hamas’ Al Qassam brigades. The Military Attorney General has now published the results of the investigation into that incident (section 2 here). “In media reports it was alleged that on 20 July 2014, at around 14:00, seven members of the Ziyadeh family were killed as the result of an IDF attack on a building in Al-Bureij. The incident was subsequently referred to the FFA Mechanism for examination. Clearly the BBC needs to take the long overdue action of adding footnotes to both those reports in order to clarify to visitors to its website that the three civilian Ziyadeh family casualties were brought about by the fact that terrorists – including three of their relatives – were using the family home as a command and control centre and that most of those killed in this legitimate military operation were terror operatives. Particularly in light of the publication of the findings of the official investigation into this incident, the failure to clarify its circumstances in the content still available online potentially risks the waste of publicly provided resources on easily avoidable complaints to the BBC. Between August 16th and August 20th inclusive the BBC News website’s Middle East page featured an article titled “Dutchman returns Holocaust medal after family deaths in Gaza“. The same article also appeared on the website’s Europe page, as did a filmed version of the report (also shown on television news) by the BBC’s correspondent in The Hague, Anna Holligan, under the headline “Dutchman returns Holocaust medal to Israeli embassy over Gaza deaths“. Mr Zanoli’s story got considerable exposure from other news organisations too, including the New York Times. But, as Elder of Ziyon reported, there was also someone else present in the house at the time of the incident on July 20th. The Ziadah family’s “guest” – as he was described by the PCHR – was Mohammed Mahmoud al-Maqadma, aged 30, who was a member of Hamas’ Al Qassam Brigades. That information was in the public domain for almost a month before BBC News ran this report. It is a very relevant part of the story which provides context important to proper audience understanding. And yet, the BBC elected to refrain from providing that information to readers and viewers. That of course suggests to viewers that at present that is not the case – which is misleading to viewers. All Israelis regardless of religion, gender or ethnic background of course enjoy the same political, social and economic rights and opportunities. The residents of PA controlled areas of Judea & Samaria (areas A and B) and of the Gaza Strip do not live under the control of the Israeli state: their political, social and economic rights are controlled by the Palestinian Authority. The residents of Area C (less than 5% of the total Palestinian population) do indeed still lack full rights because the agreements signed by the PA which created the situation whereby Israel retains control over Area C were intended to be a temporary step on the way to a negotiated solution to the conflict. Unfortunately, the Palestinian Authority chose to end negotiations by initiating the second Intifada. 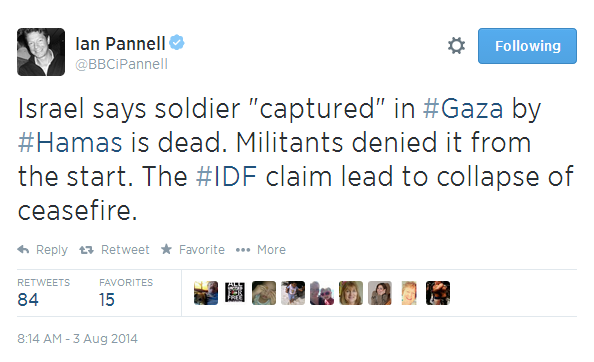 Whilst Mr Zanoli may prefer to ignore the real reason why a minority of Palestinians still lack some rights, there is no reason for Anna Holligan to uncritically amplify his misleading statement to BBC audiences.